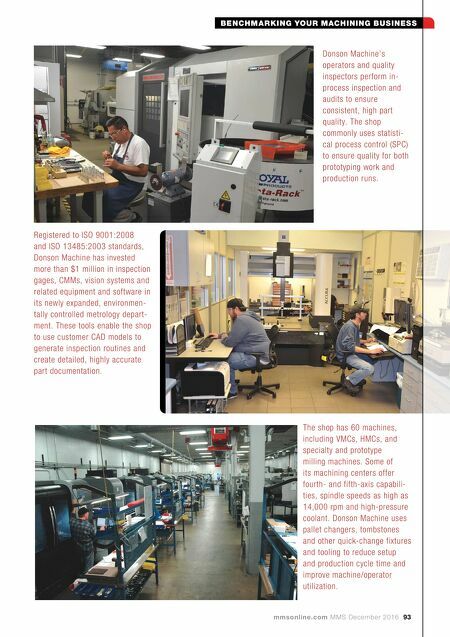 BENCHMARKING YOUR MACHINING BUSINESS mmsonline.com MMS December 2016 93 The shop has 60 machines, including VMCs, HMCs, and specialty and prototype milling machines. Some of its machining centers offer fourth- and fifth-axis capabili- ties, spindle speeds as high as 14,000 rpm and high-pressure coolant. Donson Machine uses pallet changers, tombstones and other quick-change fixtures and tooling to reduce setup and production cycle time and improve machine/operator utilization. Donson Machine's operators and quality inspectors perform in- process inspection and audits to ensure consistent, high part quality. The shop commonly uses statisti- cal process control (SPC) to ensure quality for both prototyping work and production runs. 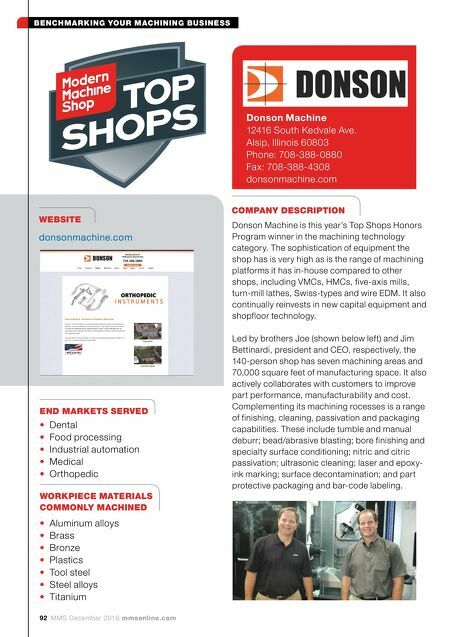 Registered to ISO 9001:2008 and ISO 13485:2003 standards, Donson Machine has invested more than $1 million in inspection gages, CMMs, vision systems and related equipment and software in its newly expanded, environmen- tally controlled metrology depart- ment. These tools enable the shop to use customer CAD models to generate inspection routines and create detailed, highly accurate part documentation.